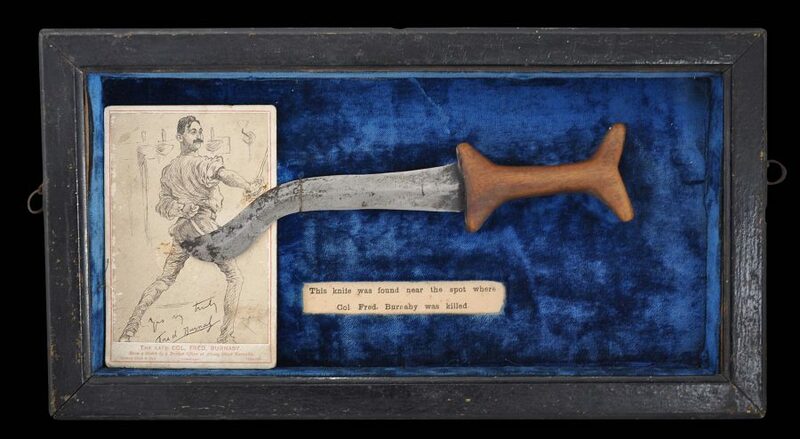 This Victorian-era wooden case with a glass front panel contains an engraved card printed with a sketch of Victorian adventurer Colonel Fred Burnaby; a North African knife with a curved steel blade and a wooden handle; and a label which says that the knife was found near the spot where ‘Col. Fred Burnaby was killed.’ Burnaby was killed in the Sudan in 1885. The knife has its origins with the Hadendoa people of the Bedja region of Eritrea, which neighbours Sudan. (See Tirri, 2003, p. 77) for examples of similar knives. Colonel Frederick Gustavus Burnaby (1842-1885) was one of the most celebrated adventurers of his day. He was an English traveller and British Army officer. He became famous for his swashbuckling exploits across central Asia and northern Africa, as well as crossing the English Channel in a hot air balloon in 1882. These exploits and his many speeches and publications saw him feted in London society. He wrote about his 1875 journey on horseback through Russian Asia to the Khanate of Khiva, which had just been closed to visitors in his book A Ride to Khiva, and this brought him immediate celebrity. 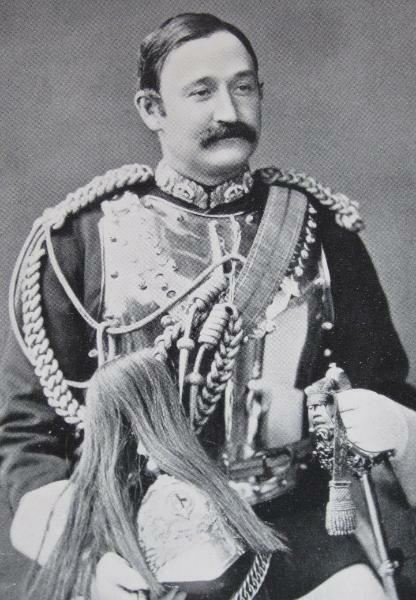 Burnaby participated in the Suakin campaign of 1884 without official leave, and was wounded at El Teb when acting as an intelligence officer for his friend General Valentine Baker. 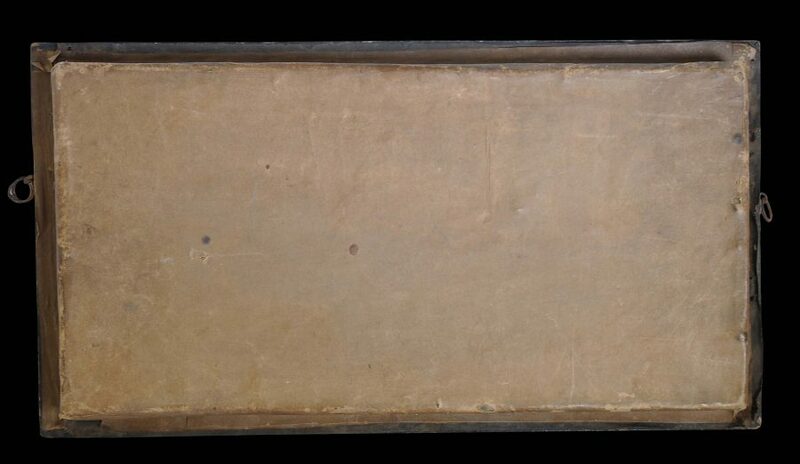 He joined a subsequent expedition up the Nile and was given a post by Lord Wolseley. He was first involved in the skirmish at El Teb, and then met his death in hand-to-hand fighting during the Battle of Abu Klea (Abu Tulayh) in Sudan in 1885 whilst attempting to rescue a colleague. Burnaby was wounded, possibly with a knife, and then finished off with a Mahdist spear being driven through his neck. The Sufi-influenced Mahdist forces were inspired by Muhammad Ahmad bin Abd Allah (1844-1885), a religious leader of the Samaniyya order in Sudan who, in 1881, proclaimed himself the Mahdi (or Madhi), the messianic redeemer of the Islamic faith. His proclamation came during a period of widespread resentment among the Sudanese population of the oppressive policies of the Ottoman-Egyptian rulers. Click here to see Burnaby’s portrait in London’s National Portrait Gallery. The portrait is included in the ‘Artist and Empire’ exhibition at the Tate Britain, November 25, 2015 to April 10, 2016, and reproduced in the exhibition catalogue (see Smith, Brown & Jacobi, 2015, p. 17). The case is complete. The velvet backing inside is bright and intact. There is some rusting to the blade and this has marked the card beneath it, but overall, this is an interesting historical relic from the Victorian era. Smith, A., D. B. Brown & C. Jacobi (eds), Artist and Empire: Facing Britain’s Imperial Past, Tate Publishing, 2015. Tirri, A.C., Islamic Weapons: Maghrib to Moghul, Indigo Publishing, 2003.